We loved Doune Castle, not because it’s grand – it isn’t – but because it’s “real”. Yes, it’s ruined, but it’s still one of the best-preserved medieval castles in Scotland. By escaping restorations in later years, particularly those done with Victorian trimmings in the late 1800’s, it has remained true to its original plan, and thus allows us to see what “home life” was like for a very important man in the late 1300’s. We should note that we are not the only ones enamored of the “realness” of this castle. Back in 1975, the famous British comedy film Monty Python and the Holy Grail was filmed here; more recently, exterior and interior shots of the castle were used for Winterfell during the Game of Thrones’ first season. 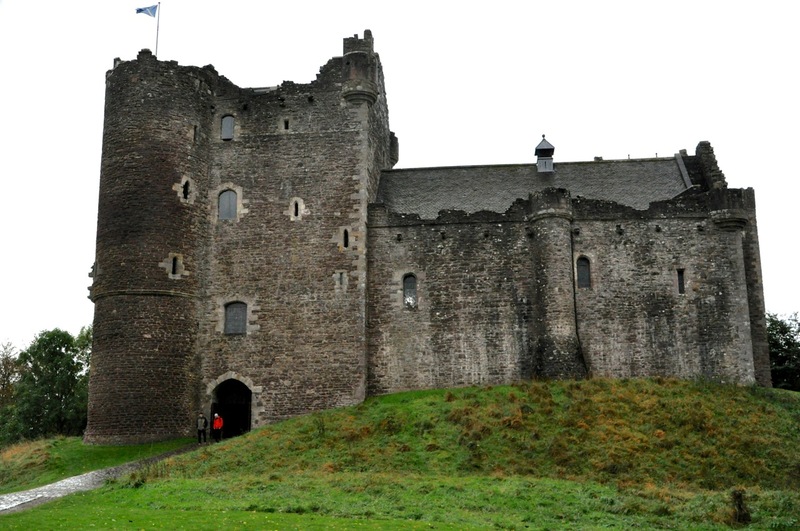 Although Doune Castle is only about 5 miles from Stirling Castle (the “crossroads of Scotland”; see the Stirling Castle post), it’s nowhere close in terms of historical importance. Still, history swirled around Doune Castle. The castle is thought to have been built in the 1260’s but damaged during the Scottish Wars of Independence (also described in the Stirling Castle post). It was rebuilt in its present form by Robert Stewart, the second son of Scottish King Robert II and great-grandson of Robert the Bruce. The castle was at least partially complete by 1381. Set on steeply sloping ground and surrounded on three sides by two rivers, the castle was strong and defensible, yet it was also built with luxurious accommodation. In an age when the conspicuous display of wealth and status were seen as vital in maintaining authority, no expense was spared on Doune. The early Stewart history is pretty interesting, so I’ll share a bit of it here. King Robert II, an aging and unpopular king, was removed from direct rule in 1386; his eldest son was politically weak, so his second son, Robert Stewart, became Regent (Guardian of Scotland), making him basically King of Scotland in all but name. Doune thus became a virtual royal castle. Then the intrigue began! With Robert II’s death in 1390, Stewart’s older brother ascended the throne as King Robert III. However, Stewart’s astute (read: ruthless) political maneuvering allowed him to retain his role as Regent. In 1393 power was returned to King Robert III, who was to rule with the assistance of his eldest son, David. In 1399, owing to the King’s “sickness of his person”, young David was appointed Guardian of Scotland in his own right for a period of 3 years; but, due to his youth (did you guess it? ), he was supervised by a special parliamentary group dominated by Robert Stewart. David, however, did his own thing, including circumventing proper procedures and confiscating various revenues in different parts of Scotland. As soon as David’s Guardianship expired in 1402, he was arrested and imprisoned in Stewart’s Falkland Castle where he died from neglect and starvation; somehow Stewart was cleared of blame in his nephew’s death. King Robert III feared for the life of his 12-year-old son James, now heir to the throne, and decided to send him to France for safety. However, before James could reach France his ship was captured by pirates, who delivered him to King Henry IV of England (no, I’m not making this soap opera up!). Robert III died two weeks after James’ capture, making the imprisoned boy King James I of Scotland; by default Robert Stewart once again became Guardian of Scotland. James was imprisoned in England for 18 years; Stewart, of course, was not eager to ransom him back to Scotland and thus ruled as “Scotland’s uncrowned king” until his death in 1420. His son Murdoch Stewart succeeded him as Guardian. When King James I was finally freed in 1425, he executed Murdoch and Murdoch’s two sons for treason for failing to ransom him earlier. Doune Castle was forfeit and became a royal possession. 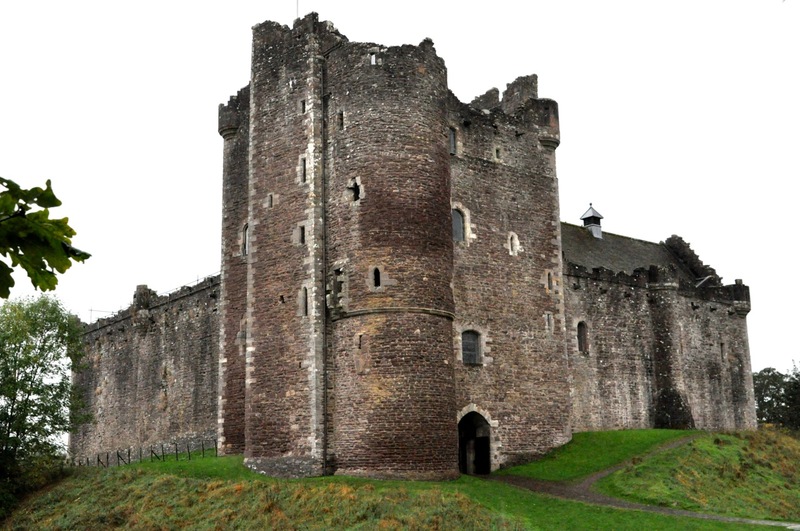 Subsequently the royal family used Doune Castle as a royal retreat from the burdens of state and a pleasant summer residence where they could relax and hunt in the nearby forests. Later it was also used as a “dower house” for the widowed wives of Kings James II, III and IV. Both Mary Queen of Scots and King James VI stayed at Doune castle on several occasions in the 1500’s. However, wars and strife began to take their toll. Doune was held by forces loyal to Mary during the brief civil war which followed her forced abdication. The Castle was involved in a number of religion-inspired conflicts with James VI and Charles I, and was the site of plots and captures and imprisonments. Only when King James VI left for London in 1603, to become James I of England, did Doune’s role as royal retreat effectively come to an end. Royalists occupied the Castle in 1645 during the English Civil Wars, and a skirmish occurred there against Cromwell’s occupation of Scotland. Government troops were garrisoned within the Castle during the Jacobite Risings of the late 1600’s and late 1700’s. The Castle was occupied by Bonnie Prince Charlie and his Jacobite Highlanders, and it was used as a prison for captured government troops. By 1800 Doune Castle was a roofless ruin. Well! Hope you enjoyed that brief history of the intrigue that swirled around Doune Castle! Back to our visit. Happily the castle was structurally still in good shape. Restorations in 1880 primarily repaired or replaced structural elements (the timber roofs and some internal floors) without adding too many “Victorian” details. The Castle was originally planned as a courtyard with buildings on all sides, but only the buildings on 2 sides were completed. As shown in the castle floor plans, there was a tower house over the entrance containing the rooms of the Lord and his family, and a separate tower containing the kitchen and guest rooms. The two were linked by the Great Hall. An artist’s rendition of what the Castle would have looked like in 1407 is shown to the left. So let’s go look at this cool castle! The most striking feature of the castle from the outside is the 100 ft high gatehouse (or “the Lord’s tower”) shown in the first picture of this post and again in this picture. In addition to being the entrance to the castle, the tower also houses, vertically, the Lord’s Hall and three further stories of chambers that were the duke and duchess’ apartments. one from the internet, shown above. The entrance is quite long and has guardhouses on both sides. 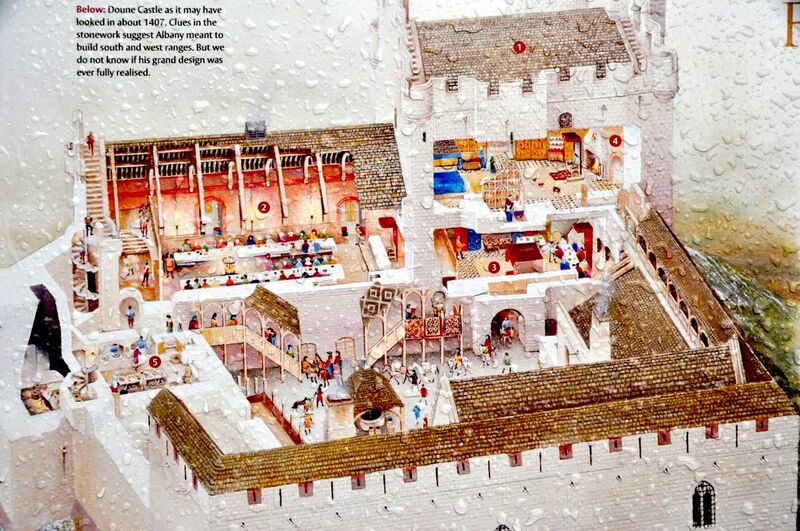 The courtyard picture above shows entrance stairs leading to the kitchen on the left and to the Great Hall on the right; it also shows one of the two wells in the castle. All the ground-floor arched doorways visible in that picture, such as the two at the far right of that image, are storage cellars; an example is shown to the left. 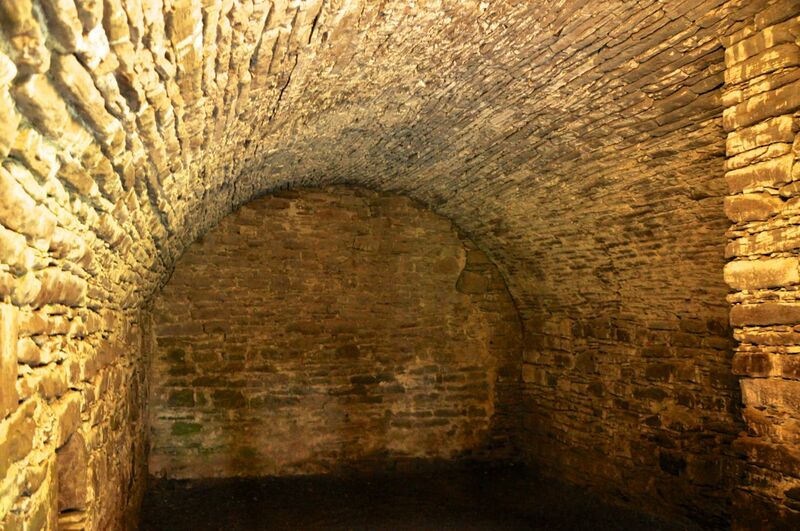 In fact, the entire ground floor of the castle building was taken up by storage cellars. feasts and large gatherings. It’s one of the best preserved Great Halls in Scotland. Heat for this large room was provided by a central “fireplace”, an area in the middle of the floor for burning fuel. There was no chimney – only a smoke hole in the roof. From the Great Hall one could enter Robert Stewart’s “Lord’s Hall”, shown below. private chamber could also have been the room above (although that room might have belonged to the duchess). There is another nice room or apartment above this one, including an en suite bathroom. above. Think REALLY big feasts! The distance from the fireplace to the serving hatches is just a few feet, so the food would arrive piping hot in the Great Hall, for sure! A stair turret leads from the lobby to two stories of guest rooms – probably warmed by the kitchen fires on cold winter nights. Finally, there are cool gargoyles on the castle walls. The ones below are on the Lord’s Tower, on the courtyard side. We hope you enjoyed this castle like we did. Although it is a ruin, there is so much of it left, unchanged from 1381, that we could very much imagine what it was like to live in a castle in those times – secure, but far removed from the comforts of our modern life! Next post – Edinburgh, Scotland.